Awka- THE Miyetti Allah Cattle Breeders Association of Nigeria (MACBAN) in the South East yesterday expressed shock over the decision of the South East governors not to accept grazing in the zone. 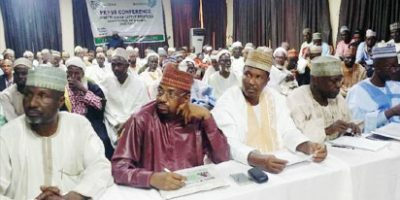 From Middle: The National President of the Miyetti Allah Cattle Breeders Association of Nigeria (MACBAN) flanked by the National Secretary, Alhaji Baba Ngelzarma, and other members of the association at a press briefing on the position of the association to stem farmers-herdsmen clashes in Abuja on Sunday. Leader of the group, Alhaji Gidado Siddiki, in a statement Thursday in Awka, said the decision was surprising to them considering the cordial relationship that had existed in the zone between the group and the five state governments. ADVERTISING He said Miyetti Allah had never failed to appreciate the commitment of the host governors in ensuring their safety, even in their rational insistence that their people must not infringe on the rights of indigenous farmers to cultivate and harvest their crops without any hindrance. Siddiki said: ?It is evident that our organization?s advocacy for peaceful coexistence among indigenous farmers and herdsmen is increasingly making successes in the South East. ?This explains our surprise at the latest stand of the governors, which, if implemented, will not only frustrate our people from carrying out our legitimate livestock rearing business in this part of the country, but might be suggestive of a kind of suspicion that might undermine the mutuality of the claim of brotherhood. ?We are mindful of the various negotiations and consultations still going on in respect of the contentious issues of ranching, colonies and grazing areas across the country, we are hopeful that these issues are considered dispassionately in the interest of Nigeria and the generality of it?s citizens. ?We of Miyetti Allah Cattle Breeders of Nigeria, south east zone, consequent upon the existing understanding we enjoy with our hosts, and in response to the latest stand by the south east Governors forum, wish to reaffirm our confidence in the capacity of our host governors to encourage the growth of our legitimate trade in their geo political zone. ?It is a very trying period in the history of Nigeria and it is our candid view that the south east whose citizens are the major bonding elements among the people of Nigeria, would provide exemplary leadership in accommodating other Nigerians in their midst, in so far such persons are legitimately engaged in their economic pursuits.? The South East governors had at the weekend in Enugu, during their meeting, agreed that open grazing by the cattle breeders would not be tolerated in the zone.